The flora of Stromboli includes an important endemism of the Eolian, the Cytisus Aeolicus, the family tree of Pulses, who once had to be thick along the slopes of the island. Today this species survives in places Schicciole, and its protection has been launched with a project ( "Eolife 99") cofinanced by EU, which is interesting also another endemismo, Chenopodiacea Bassia Saxicola, living on Strombolicchio. The most distant and most of eastern Eolian is Stromboli about 22 miles from Lipari. The island is a volcano that emerges from the sea and the part emerged is in persistent activity at least 2000 years, it was mainly formed during two cycles of activity. An ancient cycle, consisting of solid material eruptions and lava flows that formed across the eastern part of the island; most recent cycle, which consists of lava flows, which was the whole western half of the island. The current activity is considered part of the recent cycle. The crater area is formed by three cones, whose volcanic activity is predominantly explosive. Economic activity was based on agriculture. The decline of the population started in 1930, when a strong eruption and a terrifying tsunami convinced many islanders to emigrate. In the'50s began to develop tourist activity and many of the houses in Aeolian style, abandoned at the time the eruption of 1930, once restored have become a destination for holidays. It is the northernmost of the islands and has a population of about 550 inhabitants. 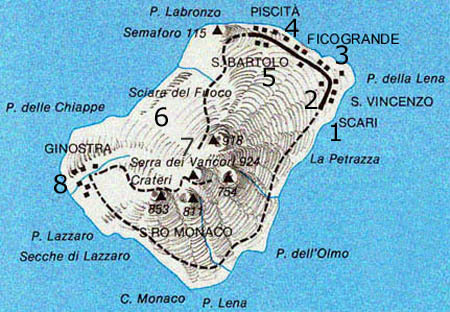 The island, north of which rises steeply to the rock Strombolicchio, is a volcanic edifice, which touches 926 m, and presents various eruptive vents, always active, with spectacular eruptions lapilli and incandescent materials, which precipitate long the steep wall called Sciara del Fuoco. The volcanic apparatus is a so-called strato-vulcano or mixed volcano, which is derived from rocks lava flows alternate with layers of pyroclastic materials. It goes under the sea for thousand meters: were in fact submarine the first eruptive events, dating to the cenozoica era or tertiary. High and dirupate are the coasts, with small beaches. The population living in Ginostra centers and Stromboli, and the traditional economic activities are fishing, viticulture and the collection of capers, and, in increasing measure, tourism. Archaeological excavations have brought to light ruins of a Greek necropolis. Excursions over land Starting from the quayside Scari we can go to see the streets and alleys of St. Bartolo, the saint patron of the island. In front of the pier of Ficogrande, about a mile from the coast, stands majestic (the shape of a medieval castle) the islet of Strombolicchio. As it is the rest of a small cone of an eruption side. Trekking Naturalistic interest is climbing crater. Three hours of travel to reach high altitudes, allowing to attend the explosions from areas nearby. It is appropriate to make the trip with guides. Tours by sea Starting from Scari, arriving at the surface of water in front of Punta Labronzo you can admire the Sciara del Fuoco "picturesque explosion of lapilli and glowing lava flows. Continuing to reach the small village of Ginostra, untouched paradise, with the green of the Mediterranean scrub and the deep blue sea. Sciara del Fuoco Wall rock that sinks in deeper depths, depths inaccessible to divers, pointing towards the pit of the Tyrrhenian (over three thousand meters deep). The Dorsale of Sciara This is a massive ridge with two peaks: the first is at 35 meters, the second at 20. Reached 35 meters, opens a precipice, which is lost in a black abyss. The fund's rocks discovered a large quantity of stars Pentagon. The Secca of Scirocco This is a massive mountain surrounded by a number of large boulders rich in fish and with a spectacular morphologies all its sides are covered with red coral and gorgonians.